Following the previous weeks retreat in the face of gale force winds on the Pentland Hills we were determined to get back at the first opportunity. This opportunity arose on Monday with fine weather forecast and on this occasion, our friend Guy with nothing else arranged for that day. Once again, there was no real rush to get away at the crack of dawn and so we arranged to meet him at Irvine station at eight o’clock Monday morning. The skies were clear blue and stayed that way the whole journey to the start point at the Ranger Centre at Flotterstone. The countryside looked wonderful again but this time thankfully there were no high winds to spoil it. As we got close to the Pentlands Nita and Guy spotted a light covering of snow on the higher slopes …nothing much, but enough to make the scene even more beautiful. Our first hill of the day was Turnhouse Hill, the place we’d been forced to retreat from on our previous visit. This time, on reaching its eastern end, we could stand and enjoy the magnificent views all around. Below us we could see part of the Glencorse Reservoir …around which we’d walk on our way back to the car later in the day. Ahead of us we could see each of the three other tops we were planning to visit, Carnethy Hill, Scald Law and East Kip ….each one with a white shading of snow on its north facing slopes. 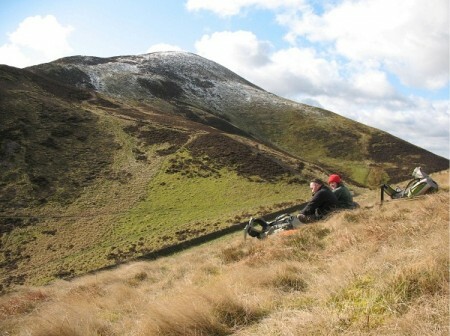 This time we ambled along the broad grassy ridge of Turnhouse Hill and on descending into White Craig Heads, (the col between Turnhouse and Carnethy hills) we stopped and sat down in the bright sun. It was a magnificent spot with the bulk of Carnethy Hill rising in front of us. With its steep northern slopes in shadow and a good scatter of snow still lying, it looked a good deal more imposing than in reality it was. A large well made path leads up onto the wide stony summit of Carnethy Hill at 573m. Even on this relatively calm day, it was a cold place to stand even in the sun and so after a few photos we kept on ….now descending grassy undulating slopes leading towards Scald Law. By this time cloud had bubbled up creating a patchwork of light, shade and changing colours across the landscape. 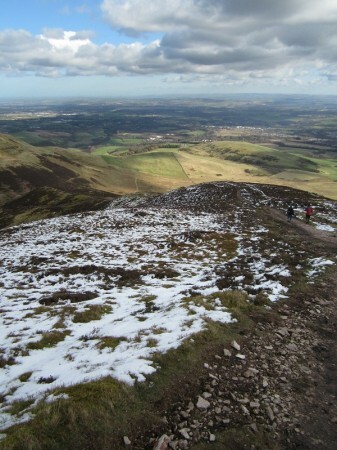 Scald Law, rising to 579 m, is, by a few metres, the highest point in the Pentland Hills. On reaching its summit (after checking with Guy that his leg was feeling fine) we had the customary handshake ….…it seems like he is back in business! After another sit in the sun while pawing over the maps to agree on a line of descent from our next and final top East Kip, we donned the rucksacks and carried on. The final little climb to the top of East Kip is surprisingly steep, but it is a great view point and well worth the effort. The neighbouring West Kip was not much further on, but we decided it was time to start heading back. We descended easy grass slopes down into the glen on the north side of the hills we’d been walking, picking up a path next to the beautiful Logan Burn and following it a short distance to the head of the metalled road at the western end of the Loganlea Reservoir. It’s a lovely location and on this day the water was calm enough to give some wonderful reflections. 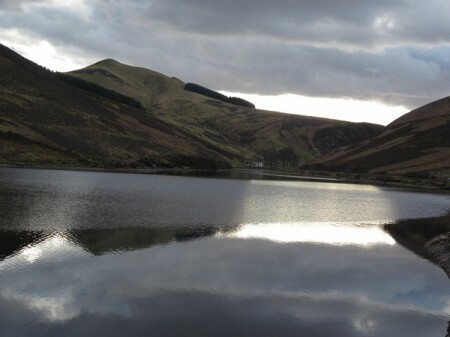 Beyond, the wee road follows beside the small outflow stream for a short distance before reaching the Glencorse Reservoir. In the now late afternoon sunshine, the colours of the surrounding hills made for spectacular reflections and further stops to take photos. We got back to the car about twenty past five in the evening and after changing out of the gear we headed for the Flotterstone Inn ( www.flotterstoneinn.com ) for a meal. It’s a friendly place serving great food and beer …definitely to be recommended! There was still a little light in the sky at seven o’clock when we left and headed back to North Ayrshire …I love this time of year when the days are getting longer ….. and we can plan longer walks.